1. Pre-heat the oven to 200 degrees C. Rub the cleaned chicken all over with the vegetable oil and season well inside and out. 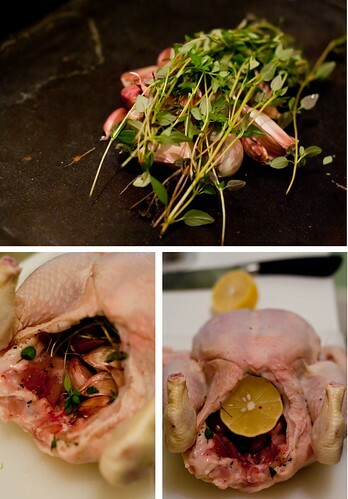 Put half the thyme, a handful of the garlic cloves and the intact half of the lemon inside the chicken cavity, then heap the rest of the thyme, lemon and garlic on the bottom of a deep baking tray and cover with the wine or water. 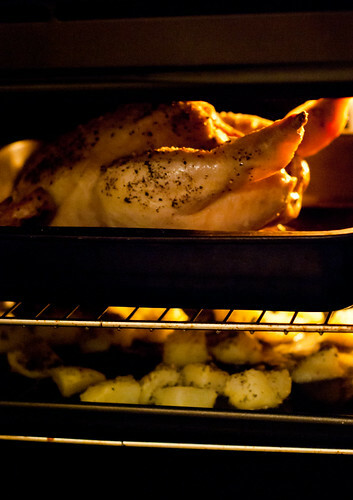 Rest the chicken on top and roast for about an hour until the skin is golden and crispy and the meat is cooked through. 2. Tent the tray with foil and let the chicken rest for 20 mins. Carve and serve the chicken with the garlic cloves (they should be soft and easily squeezed out of their skins), roasted potatoes and vegetables of your choice. I love chicken with 40 cloves, I really need to make it again soon. I like it whole but I also love it made just with chicken thighs in a baking dish! Yeah!!! It’s our favourite Sunday Roast recipe! Just love to squeeze a garlic clove on toasted bread and spread this lovely paste.